There is an opinion that berries are very healthy. And the most useful – the first spring and summer, which help us “vitaminize” after the winter. One of the first strawberries appears. Having missed the fresh berries, especially the strawberry is also very tasty and fragrant, we absorb it in huge quantities. But few people think that any product can not only benefit, but also harm. And strawberries are no exception. More than 85% of the mass of strawberries is water. And this is a special, purified water, which gives the body a huge amount of useful substances, to each of its cells. It is important that the strawberries are grown with caring hands, as well as the sun, air and water without extraneous “chemical” help. Then the berry will be really useful. This is especially important for those who lead an active lifestyle, since strawberry helps maintain the water balance in the body and supplies it with dietary fiber. Creating a volume, fiber helps regulate the digestive system, helps to cleanse the body. Fiber itself is not dangerous. But strawberries can cause an exacerbation of chronic pancreatitis. So whoever has such a disease, one should eat strawberries in limited quantities. Simple sugars account for about 7% of the mass of strawberries. What do we get mono-and disaccharides of strawberries? Carbohydrates are a source of energy, which determines the basic calorie content of the strawberry about 30 kcal per 100 g. Rapid carbohydrates of strawberries practically without obstacles get into the blood and can be used by the body for any work – both physical and mental. And the more sweet and ripe the berry – the more useful carbohydrates it contains. By the way, this allows you to use strawberries even for people with mild forms of diabetes mellitus. Strawberries are simply soaked in vitamins. However, not all of them are easily assimilated. Fat-soluble vitamins A and E are mostly hidden in berries seeds. Like complex carbohydrate starch, fats and partially proteins – they are also mostly contained in seeds. Therefore, for proper digestion, dense seeds need to be thoroughly chewed. But in practice it is very difficult to do. And it is not necessary, if your teeth are valuable to you – organic acids in strawberry seeds like to dissolve calcium. Organic acids are very variable in quantity. Juicy, ripe, sweet berries contain less, and less sunlight, strawberries – more. Organic acids in strawberries (about 1%) turn the sun into sugars. But in any case, like sugar, it is an environmentally friendly energy for humans. Among the organic acids of the strawberry, oxalic is noted. It forms calcium insoluble calcium oxalate with calcium. 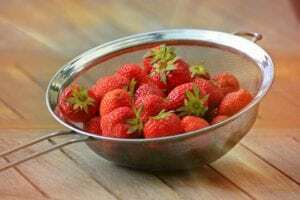 And, despite the presence of calcium among the macronutrients of strawberries, the use of this useful berries significantly impoverishes its stores in the body. As a result, athletes and people who lead an active lifestyle, this can provoke joint pain, arthrosis, and osteochondrosis of the spine. As well as slowing the recovery of bone tissue in fractures, osteoporosis occurs earlier. And what to do, do not eat strawberries? Just do not use strawberries with sugar or sour cream. 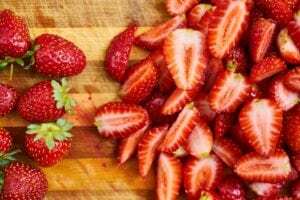 Strawberries are a storehouse of dozens of macro- and microelements that are easily digested, and together with vitamins of group B and vitamin C they support active metabolism. Also strawberry is a valuable product for those who want to lose weight because of their low calorie content. But how to stock up strawberries for future use? On the one hand, it makes the liver, accumulating many vitamins and trace elements. On the other hand, jam, jam, compote will help. But the most effective way of preservation is freezing. By the way, if you are not very sure about the ecological purity of strawberries, compote or jam is the best way out. When heat treated, the soft fiber of the strawberry will actively bind dangerous chemicals, so their negative effect on the body will decrease. And do not forget to wash the strawberries well before you eat it. The berry grows and sings practically on the ground, actively accumulating useful substances inside and far from being the most useful on its surface. That in a season of a strawberry did not have to treat a food poisoning, an exacerbation of a dysbacteriosis of an intestine.